Can't say enough how thrilled I am to have mastered this record, just released on ANTI records / Arts&Crafts. Andy is one of my favourite new artists. Drawing from a mix of 70s singer/songwriters (Paul Simon, Randy Newman, McCartney and Emmit Rhodes) he's created a powerful new musical hybrid. Check out excerpts of the full album via NPR's First Listen and get mesmerized by the video below, for "The Magician". A few months ago I got a lead from a friend on some old recording gear stashed away in a musty basement. Specifically vintage Ampex and Scully tape machines. I went to check it all out but found that most of the tape machines were in pretty rough shape, and besides the last thing I really need at this point is more tape playing/recording devices. The guy also had about fifteen old televisions and over twenty groovy rotary dial and early touch tone phones. As I was about to leave, with nothing in hand, I spotted a Fisher SpaceXpander spring reverb high up on a shelf. I'd heard about these rare units as being THE spring reverb that Jamaican dub innovator King Tubby used. I'm a huge fan of his work. If you've ever heard Tubby's dub mixes then you'll know exactly the reverb sound I'm talking about. It's crude, boingy, crazy, yet incredibly beautiful sounding at the same time. I have been wanting a SpaceXpander for years and was so happy to have finally found one. The price was right too! The Fisher SpaceXpander reverb was originally made in the 1960s and marketed for use with car stereos. It consists of a stand-alone tube preamp and a reverb tank. It's hard to imagine that there was a time when people would add their own reverb to the radio or whatever record they were playing at the time. There were actually a few of these types of spring reverbs marketed for home stereo use in the 60s/70s made by Pioneer and Sansui. The Fisher, however, is a bit of an oddball because it was meant to be installed in a car. As anyone who's had experience with spring reverbs knows, if you move them around a little too much, the springs make a loud thunderous crash sound. Could imagine what would've happened if you'd hit a bump in your 1969 Buick Skylark ... BOOM CRASH!! See this video of me running a quick and dirty drum track through the Fisher SpaceXpander. Yep it's dirty alright but so cool. The most recent addition to Bova Lab's gear arsenal. 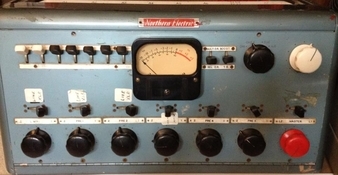 I got this 60+ year old Canadian made tube console from a friend who's album I mastered early this year. I was truly astounded at how good his pre-mastered tracks sounded. He recorded it using the direct outputs of the mic preamps. This console has that sound of old tube era recordings. Although it's only a mono console (stereo hadn't been invented yet) summing tracks through it has more depth than pretty much anything else I've ever used. Can't wait to do an all tube four track mono recording with this thing. Looking under the hood reveals a plethora of tubes and the biggest audio transformers I've ever seen, each one almost the size of a Rubik's Cube. Beautifully built! Damn excited about the recent acquisition of a Neve 5432 console at Bova Lab! Recording and stem mixing heaven! This late 70's analog board, and others in the Neve family, of course, are known for delivering the highest quality sound. This model was originally designed for broadcast use at the BBC, so the build quality is truly outstanding. In fact Neve expert/guru Geoff Tanner once said that one of these consoles took a 10ft fall off the back of a truck, hit the concrete, and still worked flawlessly. Good to know but I won't be subjecting this one to that kind of risk ever. Thanks to awesome engineer Robbie Lackritz (Feist, Bahamas, Zeus, Jamie Lidell) who introduced me to the 5432 in the first place.